This sweet piece is in Indianapolis. You can contact Jim through email at wardj2320@yahoo.com or contact me at antiquevintageforum@gmail.com for more info. While searching on flickr for something I stumbled on to Barry and Maria Stahl’s 2008 kitchen remodel. I’m a sucker for vintage, I saw that Detroit Vapor Stove on that tile wall with 1913 and I was hooked. Here’s a few pics of the kitchen before renovation. “We had an old oil furnace that was in terrible shape. We wanted to replace it with geothermal heat, a ground source, closed loop system. We got all the quotes for it and went to the bank. The crazy thing was, it would not raise the appraised value of our house enough to justify another loan, and we didn’t have the cash. But, our banker told us, if we redid the awful kitchen, that would add enough value to justify a loan for both the kitchen and the geothermal system! So that’s what we did. I got my dream kitchen and we got a reliable, fairly “green” method of heating the house. Oh, and we got central air out of the deal, too. The ceiling is now red painted beaded board, the same color as the cabinets. I’m a tall woman, 5 foot 11, so I love having high cabinets for all my treasures. I have lots of vintage enamelware and kitchen gadgets on top of the cabinets (more than in the Flickr photos, it’s really gotten kind of excessive now – ha!). It’s a very nice kitchen for 2 cooks to work, as there is plenty of counter space. Here’s how it all came together and the “red” is fantastic! And that Detroit Vapor Stove. And all the vintage kitchen collectables on the shelves. And that “1913” tile work!! Thanks to The Stahl’s for letting us visit your kitchen. Visit Maria’s blog Shallow Thoughts from Iowa and her site Sweet Gal Decals. Yep, the blog is a year old. I started it, to link to my past employer Vintage Appliances . For the same old reason, “money”, that didn’t work out. So here I am, a vintage appliance appraiser with the blog. Why am I still doing it? I don’t make much money from doing the appraisals. I love research (yes, I’m weird). I love and know about vintage appliances. I love to share the information. I love people who have and use their antique and vintage appliances. I stuck with the blog and it grows. 1. Although I love WordPress, I would have started out on a site where I could advertise. I have no clue how to change this or switch my whole blog over so it can make money. Help! 2. When you write, people read. I don’t consider myself a great writer but hey, people still read the blog! So write more often. 3. You can really make new friends over the internet. You never see them but they’re there. I can’t even fathom how much help I’ve got. Plus a free avatar design from my sweet young friend in Manhattan. They pump you up and are there when you need moral support. 4. One of the things I ask myself – “will I care about this a year from now”? Yes, I think I will. So what’s next? More appliances duh. 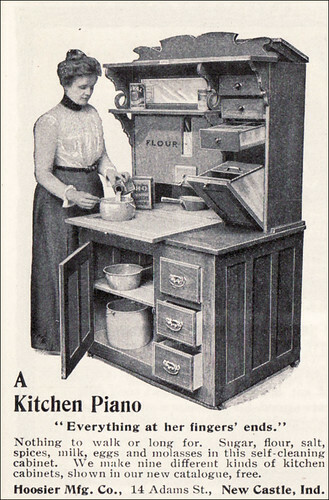 More editing, more learning, more research and more vintage kitchens. Send me pics of your kitchen or appliances or questions or ??? I’m behind as usual. Xmas is here. Got a bunch of work in from one of my ebay clients and left The Hoosier’s in the dust. But only for a few days! There’s so much I love about these cabinets. So many things were happening in history at the turn-of-the-century. I find it all fascinating! In the next week I’ll take a look at The Hoosier Manufacturing Company’s Kitchen Design Book, all those great glass Hoosier jars and how they’ve become one “hot” collectable and what happened Hoosier company. And lots and lots of pictures of Hoosier’s. The who’s and how’s of the Hoosier Cabinet’s start are a bit conflicting. On the youtube video we’re led to believe the Hoosier was invented by J.S. McQuinn who sold farming supplies. The dates and occupations of the owners of The Hoosier Manufacturing Company aren’t jiving for me but we’re pushing on. I see some smart businessmen including J. S. McQuinn joining together to form the company. The stockholders and officers were: President, J. M. Maring (of Muncie); vice-president, T. F. Hart (of Muncie) and secretary and treasurer, J. S. McQuinn. Here’s what I found about J.S. McQuinn from Biography Of Henry County, Indiana B. F. Bowen 1920. “The secretary and treasurer, J. S. McQuinn, was born in Fayette County, Illinois, and was there reared and educated. In 1886 he went to Findlay, Ohio, for the purpose of engaging in window glass manufacturing, and remained there for seven years. In 1894 he went to Albany, Indiana, where in 1896, he organized the Albany State Bank, was elected its cashier and remained in that position for four years. While in the bank his attention was called to the kitchen cabinet and, seeing the fine opportunity open to the person who should take hold of its manufacture, he sold his interest in the bank and concentrated his energies upon the manufacture of this article. That his judgment at that time was not at fault is attested by the wonderful success, which has attended the enterprise. The growth of the business has far surpassed all expectations and its present relative growth is greater than ever before. The subject’s son, Emmett G. McQuinn, is advertising manager and has entire charge of the fieldwork, devoting his entire attention to the details of the business. Since becoming interested in the enterprise the subject has removed to New Castle and has attained to a high standing among the businessmen of the City. The Hoosier Manufacturing Company was established February 27, 1900. The citizens of New Castle offered the promoters of the enterprise two thousand dollars bonus if they would locate in this city and guarantee to employ twenty-five men eight months each year. This offer, together with the fact that New Castle offered superior shipping facilities, decided them upon this location. The plant is located in the southern part of the city and consists of two buildings, a main building, built of brick, two stories and a basement, seventy by one hundred and forty-two feet, and a wareroom, sixty by seventy-two feet. A capital of about fifty thousand dollars is invested in the enterprise and forty-five men are employed every working day in the year, the pay-roll and expense for local material amounting to about one thousand dollars a week, all of this money going directly into local circulation. The output of the factory now amounts to nearly two hundred complete kitchen cabinets each week, and sales are made of the article in every state in the Union, and many foreign countries.